Producing sophisticated plastic parts is closely tied to automation at Wild & Küpfer AG. 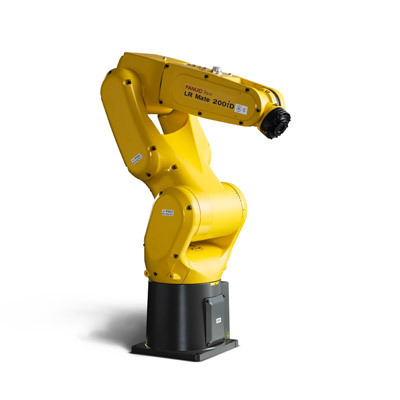 The six-axis FANUC robots also contribute added value – not least due to their reliability and their "good value for money", as it is referred to. What first started out in the year 1975 in a pig pen in Glarnerlang by company founder Tobias Wild, developed into a technology company sought after throughout European. Wild & Küpfer AG today presents itself as a modern and extremely innovative company. Seldom when conducting a report have I seen such a clean and well-organised factory premises as W&K. Wild & Küpfer AG is the manufacturer of technically high-quality plastic parts, and today employs 140 people. The major share of the 23,000 m² production area is dedicated to the Technical Division. Somewhat smaller, yet cutting-edge, is the second business division, the Medical Division. In this division, employees are still currently working under "Cleanroom Class 8" conditions. In the very near future, that classification will be increased to "Class 7". Daniel Hartmann, Project Manager and Head of Automation at Wild & Küpfer AG: "We are continuing to gradually expand this division. And the prospects are good that we will be able to implement various automation projects in the years to come, and continue towards implementation of Industry 4.0 (the German buzzword for the Internet of Things)." Plastic processing on such a high level is based on well-devised processes from development, through construction and production, right down to assembly, and includes systematic, process-oriented quality assurance. The latest innovation: the investment in a CT scanner used at Wild & Küpfer AG for measuring injection moulded parts and assemblies. This device is used for the measurement and defect analysis of assemblies. Hartmann: "It enables us to also visualise details that up to now were not measurable and accessible." Likewise, the tool engineering department, one of the company's mainstays, relies on high-performance equipment. One example of this is the use of laser cusing. Because metallic powder is built up layer by layer in this procedure, cooling ducts can be manufactured in tools that could not be produced using traditional methods. When Hartmann came to Schmerikon and joined the company in 2004, robotic automation was still in its early stages. And although the unit volumes for the initial projects were only slightly above the calculation limit, the owners Wild and Küpfer saw an invaluable approach in it: "Customers have rewarded the quality gain through automation." No one really thinks twice about a "second career" of a robot seen during the plant tour. When the production and assembly of an initial product was automated, it had already been on the market for eight years. The current status: the customer is anticipating another ten years of production time. However, even a cell like that is subject to modifications. For increasing unit volumes, additional robots were integrated. Today, robots are a normal sight in the brightly-lit production facilities. In this, the company tries to use standardised components such as robots wherever possible, as Daniel Hartmann confirms: "The standardisation helps with equipment maintenance, keeping costs of spare parts low. In addition, it is possible to maintain a high degree of availability, as we can interchange system elements or assemblies as needed." And a third reason is also important to him: "In my view, the standardisation promotes the concentration on certain products/equipment and thus fosters a partnership with suppliers." Nonetheless, suppliers are required to be competitive. Because the company's principles also include actively maintaining two purchasing or supply sources for each product, in order to have market-driven competition, all of which, however, is maintained within the spirit of partnership. For the assembly of motor PCBs, Wild & Küpfer AG put a new assembly line into operation. The module to be assembled is part of a drive for ventilation systems in building technology, whereby there are numerous variants that differ in terms of their technical specifications, but also with respect to their outer dimensions. As with several previous assembly lines, this is being implemented by Robotec Solutions from Seon, Switzerland. "There are more sophisticated cells in terms of routines", says Daniel Hartmann. The Robotec cell is an example, however, of how basic standards can be combined into a flexible cell. The level of complexity in the cell is not very high, as "only" two elements are joined together. Injection moulded parts are delivered in boxes. Supply elements are presented on trays and the assembly occurs on a rotary indexing table with several stations. Practitioners, however, will be easily drawn to certain details. For example, the first robot removes the carriers from the box in which they are delivered in layers. The integrated FANUC iRVision system helps the robot to recognise the layer and position. To enable the carrier to always be placed exactly in a workpiece holder on the rotary indexing table, however, the system uses a mechanical centring aid. A PCB placed there slides into its guided, defined position, where it is once again picked up by the robot. It's simple, yet effective. A second LR Mate with vision sets the motors placed in trays onto the carrier elements. Both components are "hot riveted" together, and at a further station of the rotary indexing table the undergo a visual and tactile inspection. After this inspection to validate the correct motor version and installation dimensions, the third robot can place the assembly into a transport unit. The model for all three robots is the LR Mate 200iD in a long-arm version with a 7 kg payload. In this version, the six-axis robots have a working range of 911 mm. The three operating panels are located on the front of the cell. The system is centrally operated via the GE touchscreen, in a top-level cell controller. Quality and completeness of assembly are immediately inspected in the Robotec cell. The inspection is performed according to principle: as easy and safe as possible. Depending upon the task, an iRVision, an optical Keyence sensor or a basic probe is used. There are currently three different assembly variants being produced on the system. A change occurs in a flash, as Daniel Hartmann confirms: "The program can be changed over in a few minutes. The workpiece carriers were also equipped with a quick-change system, enabling the switchover to another type to proceed efficiently." The program can be enhanced at any time, in case another type is added. Helpful detail: All workpiece carriers are stored in a space-saving and, above all, handy area underneath the rotary table. In order to prevent them from being mixed up, they have a distinctive anodised colour. The company takes no chanced during a format change. A barcode is printed on the "operation plans", the accompany documents of an order. All the necessary information is stored here. If the system is empty, the new order can be initiated. Wild & Küpfer AG has been working with Robotec Solutions for several years now. Daniel Hartmann: "The mutual relationship is marked by a high degree of partnership. It's also the type of relationship we have towards our customers. In Schmerikon, we have developed lots of expertise in automation over the years. Key elements of plants are partly being designed and produced in-house by us", says Hartmann. Yet he also stresses that tool engineering, injection moulding technology and the assembly of high-end products are core competencies – and not the construction of assembly lines. With an eye towards the generation of collaborating robots, the project manager has clear ideas. For smaller unit volumes, innovative cells with quick-change systems are moving more and more into focus. In solutions such as these, robots are intended to take over repetitive tasks and handle process functionalities. As a flanking measure, operating personnel is intended to provide for flexibility. Hartmann: "What's more, the networking of robots, cells and control systems is becoming an increasingly relevant topic with respect to Industry 4.0." He sees the beginning as already completed in the controllers of FANUC robots: "Now we can access the machine via a Web browser. That is a positive development and a step in the direction of networked manufacturing." Laser cusing is based on melting one-component metallic powder materials using a laser. This procedure allows the build-up of tool elements one layer at a time, based on metallic materials. The typical layer thickness is between 20 and 50 µm. A sophisticated exposure strategy enables flawless generation even of large tool cores. One advantage of this technology is that for complicated shapes in the 3D area especially, cooling ducts can be arranged in a targeted way. The tool can be optimally cooled. This creates parts less prone to warping and with shorter cycle times.